1st time milking animals don’t know the milking routine. You have to train a milk cow how to milk. We’ve trained two enormous beasts how to milk. That means we are not experts and still have much to learn and even if we had trained 100 cows to milk… the 101st would be completely different. It’s not at all like training a dog to sit or training a cat how to use a liter box. Not at all. At least not yet. Thankfully, the milk cow we are training now is friendly and well liked around here. We raised her from a little calf and she is use to us. She’ll allow us to scratch her belly and ears for brief moments. She even endured us gawking at her while she was giving birth to her first calf earlier this week. However, she is still a 1000 pound beast. The boys started bringing her into the milk stall the day after she calved for milking. They had to coax her in with some feed and then finally were able to get her head locked in the head gate so they could start introducing her to what she will be doing every day for the rest of the year… milking. 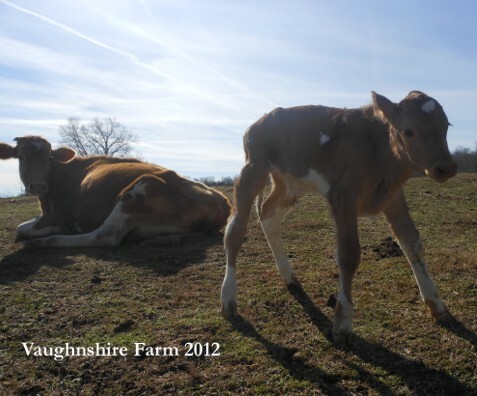 Being a new momma, she is always worried about her calf. We brought the calf in the stall so she wouldn’t worry. However, as of today, she is still not letting down her milk. The boys are milking out a little colostrum/milk from each quarter to add some relief to her massive and increasing udder. As with our last newly milking animals, they always seem reluctant at first to let their milk down. Today, the boys had decent amount of milk (more milk than colostrum today) until Dixie decided to step into the bucket while she was being milked. My oldest son milked her this morning. He is patient and docile with his training subject even if she refuses to respond to his commands. He has faith in her that she will get it….one day soon. So far, she is not proving to be a kicker…which is good. The main issue now is getting her to stand properly. She tends to want to keep her feet too far forward or too close together or step completely off the milking platform while her head is still locked in place. Too bad we can’t draw a line on the floor with a “Please Stand Here!” sign indicating the proper place to stand or install a “pull forward until the light turns red so you know when to stop” signal like at the car wash. The calf is happy and satisfied and doing much better walking around. We’re hopeful that this next week will bring about a productive milking routine that satisfies calf, momma cow and the anxious farm family back at the house awaiting fresh milk.